The Hurricanes took down ACC rival Clemson 3-0 at the Knight Sports Complex Sunday afternoon. Miami (9-5, 2-2) finished out its opening weekend of ACC play at home by sweeping Clemson 25-23, 25-16 and 26-24. The Canes defeated Georgia Tech 3-1 on Friday. 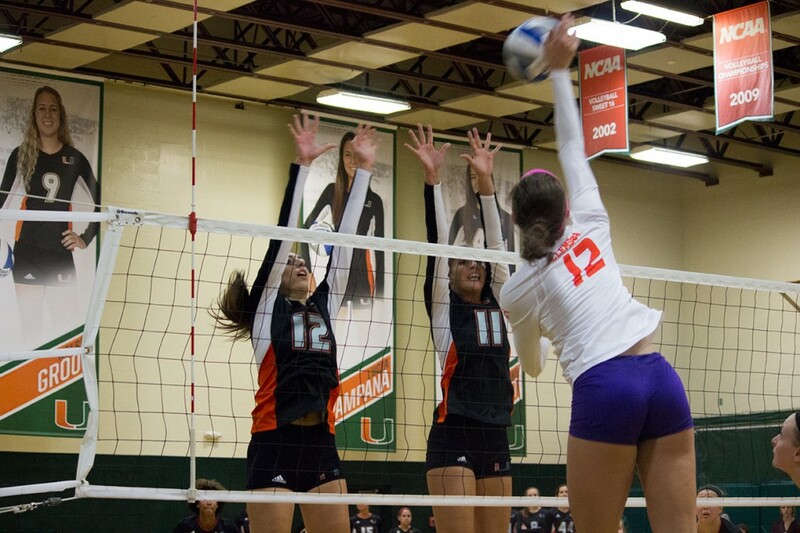 The team struggled with passing early on in the match, a common theme in the Canes’ play recently. Although this resulted in sets one and three both being decided by two points, the team’s offense once again took over and pulled the win. Redshirt junior outside hitter Kelsie Groot and senior outside hitter Taylor Scott each tallied 14 kills, while sophomore outside hitter Olga Strantzali recorded nine kills and senior middle blocker Alexis Mourning finished with eight kills. The defense received a boost from the typically offensive-minded Strantzali. Known for her ability to record kills, the second-year player had 12 digs. Senior libero Kalysta White demonstrated her defensive prowess with 11 digs against the Tigers. “You have people off the bench doing their role, you have everyone on the court doing their role, and it takes the pressure off one single person,” Groot said. The Canes go on the road to face four more ACC opponents over the next two weeks. The Canes next play Wake Forest Friday at 6:30 p.m. in Winston-Salem.